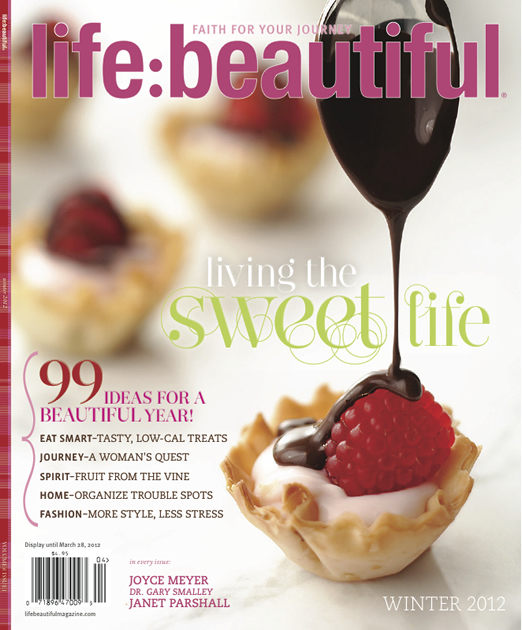 If you're out and about doing some post-Christmas exchanges/sale shopping, keep an eye out for the absolutely lovely winter 2012 issue of Life:Beautiful magazine. I was SUPER blessed & excited to be able to share my passion----faith-based style----on such a great platform. Life:Beautiful is "faith for your journey"--on par with Martha Stewart Living in quality, beauty, and content, but with Scripture and Biblical affirmations the whole way through. So uplifting to read a magazine that offers encouragement instead of false ideals and empty promises. It is truly inspiration for a beautiful life. I wrote an 8-page article for them on modest fashion & beauty, with tips for thrift store accessories & vintage finds, along with 12 "Foundational Pieces" every woman should have in her wardrobe. I had SO much fun and so many amazing, wonderful memories from this trip (remember my secret trip? It was for this article! and so were the 'photoshoot' false eyelashes!). So a big WELCOME to my new beautiful new Life:Beautiful readers!!! I'm so pleased you're here! I am super excited to continue sharing with you what God puts on my heart about beauty, women, and style with substance. I hope I can do justice to it, with God's blessing & inspiration. May my blog become even more and more a tool of God's hand, and may my art be from His heart. And a big thank you to the Life:Beautiful team for not only doing what they do, but for letting me be a part of it! PS. 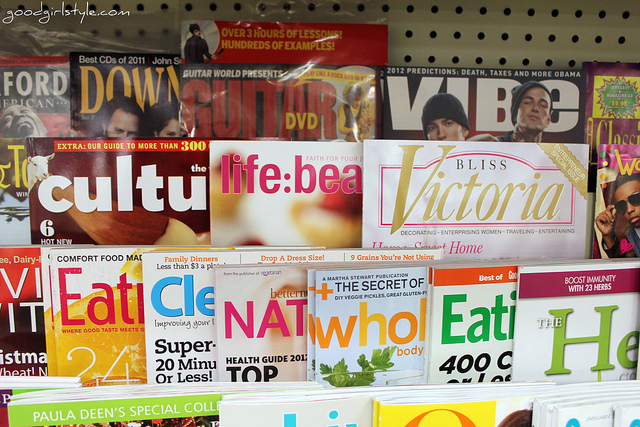 Your best bet for finding the magazine is Barnes & Noble! Also try Walmart, Hallmark, Joanne's fabrics, and Walgreens :-) Or just subscribe! I subscribe to life:beautiful and found your blog through your article. I can't wait to see more of your style. May God bless you even more this coming year! I found your blog through your great article in Life: Beautiful magazine. I have 3 teenaged daughters and it's such an encouragement to find cute, fun, modest clothing ideas. My 15 year old has a great fashion sense and loves to shop vintage with me. GREAT job on the article! I, too, found your blog from the 'life: beautiful' magazine - congrats on such a great spread!! Your ideas for outfits are great and, let me just say, it's incredibly refreshing to hear how to build a wardrobe by shopping yard sales and thrift stores. Thank you for showing it's possible to create a beautiful look on a budget! Thank you for the wonderful article! As an older (in age but younger at heart!) woman I struggle with looking dowdy and old (gack!) and wanting to look fresh but modest. I know that your layout was for the younger Christian woman but I have taken some of your suggestions to heart and can see a way to look fashionable. What a great mentor you are! I'm so excited for u Natalie! What a bledsing! I will pick up the magazine tomorrow. It's so encouraging to see great women of God doing something great for Him. Hi Natalie - my Mom and I saw the issue today and picked it up - I'm devouring it and am here visiting because of your article in the mag. I love your style and you are beautiful inside and out! Happy New Year! Just finished reading your article in my favorite magazine! Great job! It's so refreshing to see a beautiful, young woman wanting to dress the way I was taught to dress. Classic beauty never goes 'out of style'! My mother always presented herself this way, and I have tried to teach my daughter the same. Even though I am old enough to be your mom, you are right on cue with what you are presenting to everyone. Keep up the great work! I am now following your blog and will be passing on your great style to my daugher. Okay girly, I just found you via my favorite magazine and so glad I did!! You are so fun! 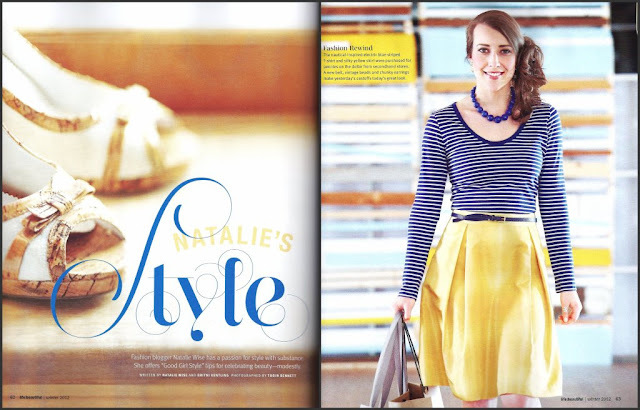 :) I actually think we might be kindred spirits because I'm a consignment store junkie... In fact, I wrote a post all about it back in September! And I love everything you said about modesty and pleasing God with our clothing... so refreshing and such a great reminder. There needs to be more of that in this world! Love the article and was wondering if you are able to give shopping info for the striped shirt and turquoise sweater in the article-I thought that outfit was so cute! The article was beautiful, and I'm happy to have discovered your blog! Hi There! Thanks for your note :-) The striped shirt is from Ann Taylor Loft, and the turquoise sweater is J.Crew! Looks like they still have similar versions available! Thank you so much, Dorothy, that really means a lot. We tried very hard to make outfits we though women of all ages could modify slightly to look great! I loved it! I'll pop over and say hello on your blog when I have a sec! Not only are yard sales and thrift stores budget-conscious, they are FUN! I love it! *Don't forget* Books-a-Million...That's where I pick up my copies of Life:Beautiful. I'm so glad you were in there Natalie, that's how I came across your blog...like literally three days ago. Your blog is very refreshing and nicely done. I'm excited about having a new place to visit on the web! I loved the article in Life:Beautiful about your style. I have a beautiful 29 year old single Christian daughter who also imbues herself with modesty and style. Young women need good examples like you. I wish every girl in the high school I work at could see your example! I loved your article and finally stopped by your site today. Super cute and thanks for all the great ideas! Blessings! Thanks, Katie! You're so sweet! This was last winter's issue, so you'd probably have to call them up and order a back issue if you're interested. But do check out the magazine, it's awesome! There are so many options out there that I'm totally overwhelmed .. Any recommendations? Many thanks!